Perhaps they were doomed by their awkward and non-commercial name. This Miami, FL beat group had the makings of a hit right here that stopped in its tracks in the lower region of the top 100 charts after being picked up for national distribution by Columbia offshoot Date Records. The fantastic harmony vocals through the song are handled by brother and sister team Travis and Coventry Fairchild, (whose real names are Joseph and Loraine Ximenes), and the track is driven along nicely by those infectious handclaps, bubbly bass and a very driven folk-rock electric guitar. The group released three more singles which went nowhere, and broke up in 1967. Thankfully this record, one in which "the magic" happened, was pressed for us all to enjoy in perpetuity. 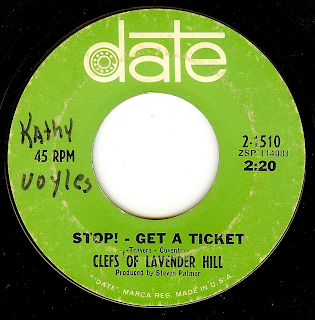 Actually the first time I heard that song was in a different form as "Stop and take a Ticket" by the Statesmen, a band hailing from Cleveland/Ohio who released their cover in 1967 on Tema 137. Their version resurfaced on "Highs In The Mid Sixties Vol.9" and sounds to me even better than the original which I discovered years later.